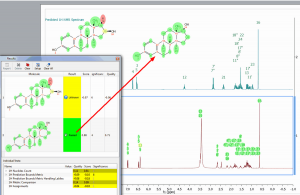 Click on the OK button to get your spectrum, a table of verification results and the structure, annotated with color coded assignments (green is a good assignment, yellow is poorer assignment and red is a bad assignment but which still allows the software to make a total assignment of the structure). 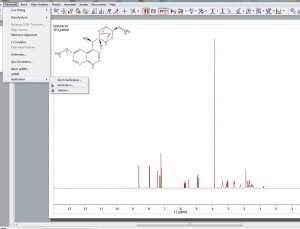 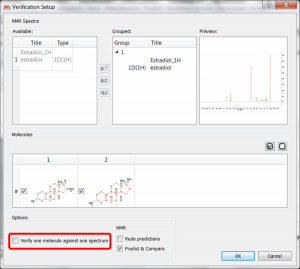 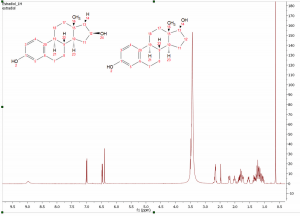 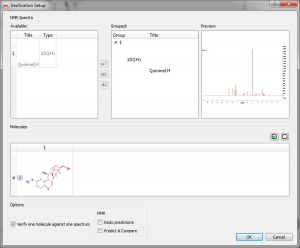 Mnova Verify can be used to run one set of spectra against more than one potential structural candidate (or vice versa). 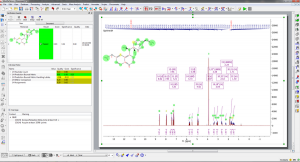 The software will run the spectral set against both structures and present the user with a score for each structural proposal, which may in many cases allow the user to differentiate between 2 possible candidate structures.